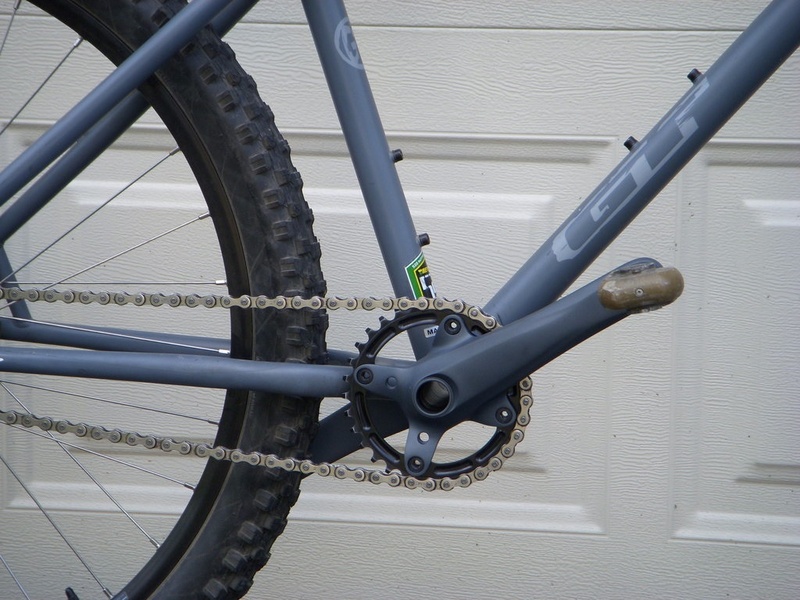 So, a few weeks back I had another member (badmechanic) post up a pic of a modded XTR crank one of my threads. I was blown away even further when I went to the guys site and saw his gallary section. I was sold right then. My delima was that it meant that I would be without a crank for a little while and unable to ride my bike. After a quick email to him, we agreed on a core deal. Awesome, I could still ride while waiting for my new cranks to be completed. I was able to choose the color, length, as well as the option of even getting a chain ring, bolts...all coated. Just awesome. During the wait time, we emailed back and forth several times and while the couple week wait seemed like an eternity, I never once felt like I was being swindled in any way. Dale kept me informed and even helped to build my aniticipation a few times by send more photos of what mine would look like. I know there have been a few people that have gotten turned off due to the turn around times of some custom parts, be it coated parts from creakikoat or chain rings from Home Brewed. But having parts from both guys, I can only tell you that it is worth the wait and in both cases, the guys put alot of sweat into their work. The parts are great and light and both add that extra little bling to your ride. I should add that the XTR crank arms, bolts, and chainring weigh in right at 540 grams. (unfortunately, I did not weigh my bearing cups because I was too lazy to take them out just to get a weight but the total weight including the bb cups should be right around 630 grams or so.) My cranks are a 170mm btw. This is what I started out with! Looks like he did a great job....what made you go with that finish versus polished? Yea, he does, i have the same crank done by RD on my bike as well. The benefit to the coating is that it lasts. Your shoes wont take this coating off, and you dont have to constantly keep up on it with polish. My last crank was polished, and it did look great, but i just really like the simple black finish. It looks less like a crank that someone just cut the spider in half on. Exactly. I really didn't want alot of bright shiny bling on my bike other than my hubs (white's that have a mirror finish). I wanted it to be close to color matched which it is and looks closer to the color in the sun light. Also, anyone can get a polished crank. 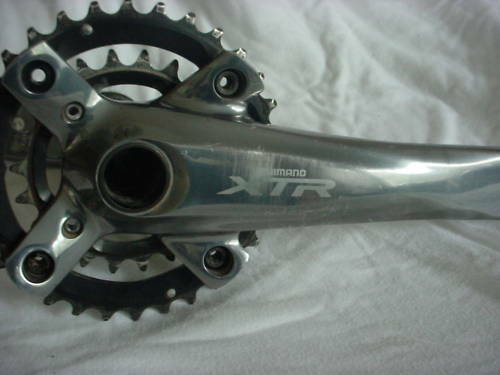 Even my first set of XTR's were some what polished as you can see. But not much of anyone right around my area has a set like this! They just sort of blend with the rest of the bike. You know, stealth bling! I really didn't want alot of bright shiny bling on my bike other than my hubs (white's that have a mirror finish). I wanted it to be close to color matched which it is and looks closer to the color in the sun light. Also, anyone can get a polished crank. I think it is a relatively inexpensive upgrade if you will when you polish it up yourself. It is definitely a time consuming process. But it will quickly go dull if you don't keep up with it. I don't have time for that myeslf though I normally keep my bike pretty clean. I think there is also the pride factor in there for doing it yourself. I don't need any more pride in my life! I really liked some of his examples on his website. Maybes I check them out if I ever own worthwhile crankszs. I have a set or Aerozine cranks that RD did that are pretty nice. Even lighter than the xtr's, and they use the same type of external BB also. I own a pair of crazy8 cranks as well, and am nothing but happy with them. I don't like polished anything, and with the black coating it makes it look factory. It's cool that people generally don't notice it on my bike. The ceramic coating is also very durable, and hasn't scuffed from my shoes yet (I ride like a duck). 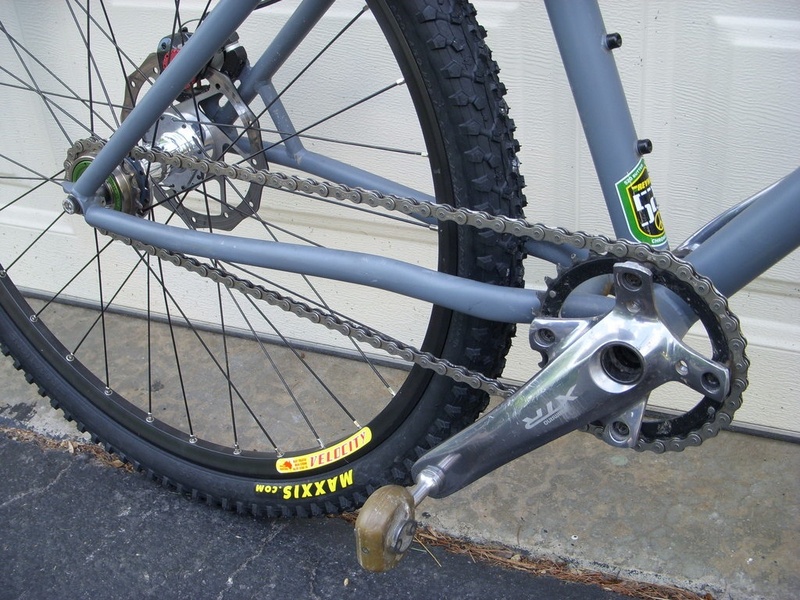 umarth and farrisw1, just go pick up a pair of M960 cranks off eBay and get it done. It's so worth it. +1. 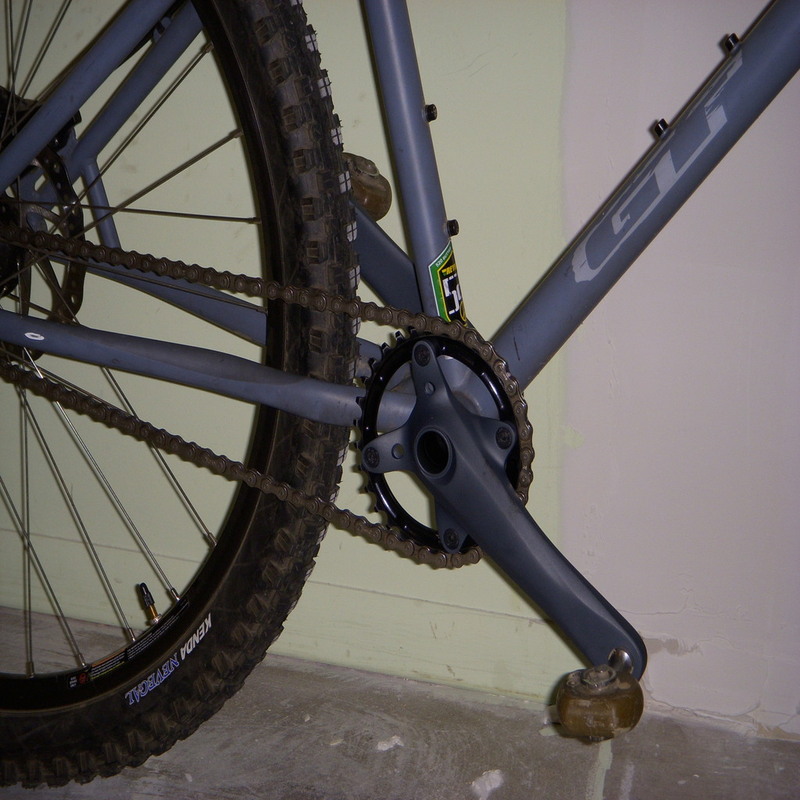 When the industry went to 4-bolt cranks several years ago, it took a giant step backward in crank design. I've been looking around on ebay but haven't come across too much....what would you say would be a fair price for a used set of 960's? Oh, also, what's the consensus on the 970's? I'd say between $100 and $130. The M970 isn't as good looking, isn't as light as a modified M960, and the LH arm retention and bearing preload mechanism is a huge step back. The only good thing about them is the standard BCD. Wow, did he transform your rim and tire too? Looks pretty cool, I thought about doing something similar with my Race Face cranks (also 4-bolt) but I am leaning towards ENO cranks with a Phil Wood BB and just be done with it. No I did the wheel transformation all on my own. Bent the rear wheel on a ride last week and it is now at the shop waiting for a new rim to arrive. Had to stick the sock wheel back on there for the time being. I don't blame you. The WI's are a very nice cranks. It won't be as light as mine but it very well may be stronger! The finish is beautiful but I already dislike wiping down my hubs to keep them shiny so I know it would wear on me having to maintain the crank as well. Especailly knowing that it would start to get scuffed up and what not. Ok, I think I got some better pictures today of the bike outside. Still don't have my nice wheels on the bike but the good news is that the wheel has been rebuilt but needs to be tensioned up then they need to install the tires/Stans kit. Can't wait. Just out of curiosity, I hear alot of guys talking about bending chainrings. Is this because you are banging it into the logs and what not when you are riding over them? You know, pulling the front tire over the top, catching the crank/chainring, then having the rear tire hit it? I rarely have this occur. Not that I am the greatest rider mind you and I am not trying to toot my horn here. But for one my local trail seems to have a way around just about every obstacle on the trail so you can easily (for the most part) ride around the obstacle. Secondly, I would say that my bike handling skills are pretty good which probably comes from years of riding bmx bikes. I have learned to either flat out bunny hop the entire thing (depending on length/height) or to pull the front tire over the top, do a bit of a bunny hop while diving the nose down to almost doing a nose wheelie down the other side. This allows me to by pass the whole chainring smacking into what ever it is that I am going over. Don't get me wrong, I have smacked it before when going over a drop. You know, it was a down hill, the log looks 6" on the approching side but is like 11-13" on the back side. Normally, I would say just hop it all together but there are a bunch of roots like 10' past it where I will be close to landing so not the brightest idea. But for the most part, my method seems to work pretty well. also, RD has crank arms in stock ready to modify already you guys, you don't have to search around on ebay for them. He has already done the leg work for you! i dont think you'll have a problem. Just make sure your chainring bolts are tight. Definitely check them on occasion. Thanks but I can nit pick it to death. Cables are about 1-2" too long. Don't care for the puny little rear drop outs on the frame as just about all nut tuggers don't fit. Want a seat clamp with binder bolt instead of QR. I think my favorite parts are the fork and CRANKS! Another satisfied customer here. I have his m 960 crank and tiramic BB in titanim color also with the black chainring. 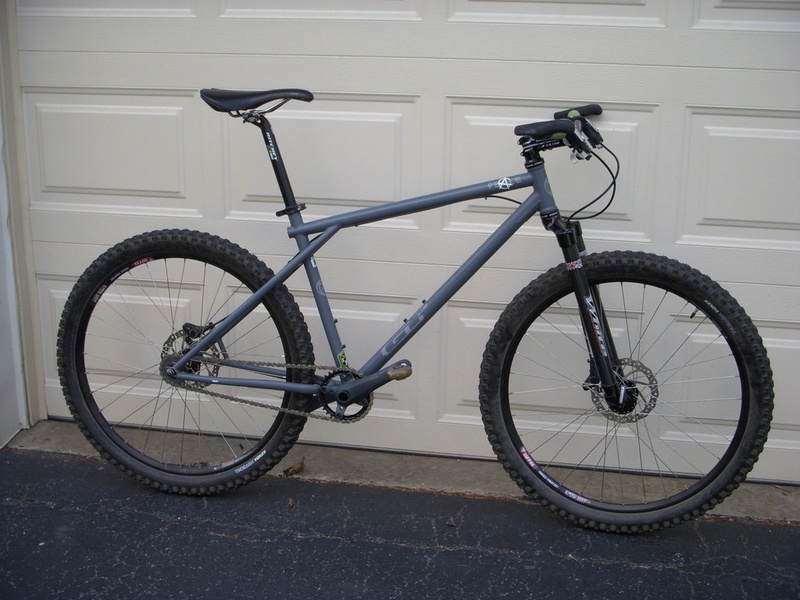 It is on my Lynskey ridgeline single speed. The crank looks like it came with the Satin colored bike it's on from the factory. RD is a great vendor and fun to deal with. Got a question on his parts....send an email. Full blown complete responses. He takes care of business. 5 out of 5 stars ! In fact .....emailed him today .....a few times with another project. Can u tell I like working with him? Hey, ancient rascal, did you ever put up pictures of your new ride? I have not. Still need to put on the back break. I bought take offs and the rear needs a new brake line. Have a creaking problem that crazy8 is helping me with by using a ceramic lubricant film. Send me a pm with your email and I send u a pic. Came out killer. Plus I will have to get with my daughter for help posting it up. Posting my Klein in Rigid SS was like performing brain surgery for me. 16 3/4 lb mountain goat. Unreal climber. PM me bro !